What Are You in the Dark? The campground and/or its national parent company have a strong focus on network connectivity and supporting the vagabonding technologist in his/her travels. They have invested heavily in infrastructure upgrades and work continuously to ensure positive digital experiences for their customers. Good WiFi hardware with decent signal strength and range is fairly cheap these days and no one uses the internet at 5:30 AM at a campground. I want to believe it was number one. It would make the technologist in me very happy. 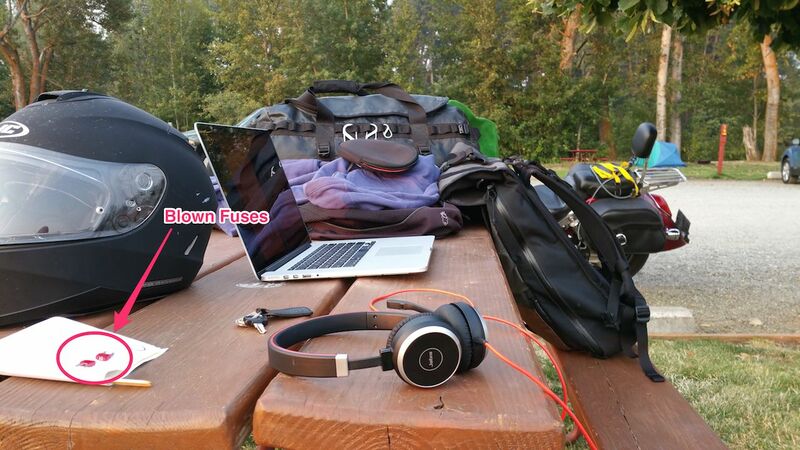 Later in the morning I packed up my mobile office and camping gear to head into a coffee shop in town. I was blessed by a pretty sweet little office nook and flawless, high-speed internet connectivity. I would like to believe it was due to the same rigorous standards as point number one above regarding the campground’s WiFi. Clearly some city statute holds businesses here to a higher standard of internet accessibility. I’m sure it had very little to do with me being the only person using the WiFi. Last night I discovered my turn signals were not functioning. After a bit of troubleshooting I traced the issue to a blown fuse controlling the turn signals and brake lights. I replaced the fuse with a spare and promptly blew that one as well when testing the signals. While the lack of functioning turn signals is not too terribly concerning I would prefer to have them and I would really prefer to have functioning brake lights. Hand signals are an effective way to communicate your directional or velocity-based intentions on the road, but nothing says “STOP” light a giant red light blazing directly in front of you. As a short-term fix, I bridged the fuse so that the brake lights would work (they weren’t blowing the fuse anyway, it was the turn signals) and picked out a couple of repair shops to call when reaching Seattle. I also refreshed my memory of motorcycle hand signals. Super useful, although it looks like things could get a bit precarious if you are pointing out Roadway Hazards on both left and right sides of the bike simultaneously. Mondays for me are usually booked solid. I’m in meetings almost all day. Meetings to recap what happened last week. Meetings to plan for this week. Meetings to touch base with clients. Meetings to discuss career aspirations and performance. Meetings to review finances and budgets. Meetings to decide what meetings are necessary. This proved to be true on #WorkFromMotorcycle as well. The major difference was that all the meetings came to me via video or phone conference. I was able to connect with coworkers seamlessly in almost every case, had access to the information and tools that I needed, and felt connected to the workflow of the day. This is in part due to the many technologies we have available to use in remote working situations in the modern age (who says that, "the modern age"?). It is also due mainly to my amazing coworkers and how willing they are to embrace change and push themselves outside established comfort zones. Thank you all for empowering me on this journey! Today also marked the moment when my daily routine finally sloughed off and left me a bit raw to the world. While by no measure alone, due to technology connecting me to my friends, family, and coworkers, I am physically isolated from those familiar places and possessions that bring me comfort. Comfort or maybe just a touchstone to a more defined version of who I am. A more expected daily outcome or experience of the world, perhaps? One of my favorite concepts in storytelling, whether it be via TV shows or movies or video games or books, can be summarized as “What You Are in the Dark”. The TV Tropes site has a good explanation of it and my most favorite expression is the culmination of all the decisions and experiences of your character in the epic Mass Effect video game series (the current trilogy, at least). In short, the hero arrives at a decision point where he or she is faced with a choice. No one will know what choice the hero makes. He or she is free from any external perceptions that may or may not influence their choice through expectations, social/societal pressures, or judgements. They are free to act how they choose. But what will that choice be? The aspirational hero for me is the one who “does the right thing”. A hero that acts in accordance with an internal compass that guides them with unerring certainty in their decision making. Aspirational in that I aspire to feel that quality, that certainty of direction, reflected in the work that I do and the person that I am in the world. This isn’t a new struggle or a new set of questions. This is me taking my compass out of the box I keep it in and learning how to read it in a new way. How to find my own way. What am I in the dark? I don’t know. It’s scary in the dark, but I won’t find myself anywhere else.